Atrophy of neurons in the prefrontal cortex (PFC) plays a key role in the pathophysiology of depression and related disorders. The ability to promote both structural and functional plasticity in the PFC has been hypothesized to underlie the fast-acting antidepressant properties of the dissociative anesthetic ketamine. 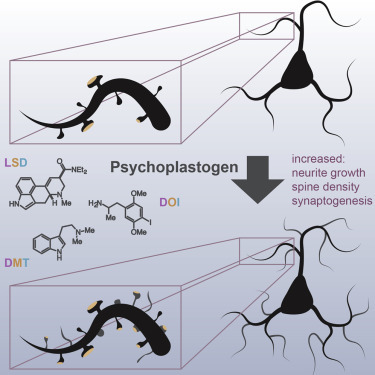 Here, we report that, like ketamine, serotonergic psychedelics are capable of robustly increasing neuritogenesis and/or spinogenesis both in vitro and in vivo. These changes in neuronal structure are accompanied by increased synapse number and function, as measured by fluorescence microscopy and electrophysiology. The structural changes induced by psychedelics appear to result from stimulation of the TrkB, mTOR, and 5-HT2A signaling pathways and could possibly explain the clinical effectiveness of these compounds. Our results underscore the therapeutic potential of psychedelics and, importantly, identify several lead scaffolds for medicinal chemistry efforts focused on developing plasticity-promoting compounds as safe, effective, and fast-acting treatments for depression and related disorders.